As humans, we are given to packaging concepts neatly into compact little statements. This is especially true with Christians trying to present biblical truths such as the one at left. This has become much more prevalent with changeable signs in front of church buildings. Yes, the truth presented by most is designed to capture the thought of the unsaved passerby; and in that place, I shouldn't be too critical. However, too often, these supposedly pithy quips bypass the mind of the pre-believer, and land securely within the mind of the believer, leaving him or her with only a half-truth. A half-truth is generally a one-sided story. Such is the case with the idea that Faith + Nothing = Salvation. 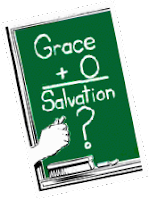 This thought came about mainly as a criticism against salvation by doing good works as taught by some denominations. John 3:16 and Romans 10:11 both say very plainly that all that is necessary is belief. We have probably all heard something along the lines of, "It's in your head, but it needs to drop 18 inches into your heart." This is an effort to make the distinction between mental assent and true biblical faith. "And to whom did he swear that they would not enter his rest, but to those who were disobedient? The passage, of course is referring to the Israelites not being able to enter Canaan upon their deliverance from Egypt. They represent two distinctly different words in the original manuscript. Consider this explanation taken from Vine's Expository Dictionary of NT Words. If, as many claim, faith plus nothing equals salvation, then why did Peter write such a thing? It is only as we begin to understand the biblical teaching of salvation that we can possibly begin to make sense of this idea of "adding to faith."